“In Conversation.” Interview with Jamal Ali. Freefall 26.1 (2016): 79-83. Q: What do you think a poet’s “job” is? “Cool Books for Hot Summer Days.” UCalgary Alumni Magazine. Interview with Deb Cummings. 21 July 2015. Q: Whose sentences are your favourite, and why? A: The American, David Foster Wallace, writes the most rambunctious, intelligent, relaxed sentences. The Brit, Zadie Smith, writes the best dialogue. The Canadian, Miriam Toews, is lately my favourite paragrapher. “Week 25- Ian Williams presented by Robyn Read.” Celebration of Canadian Poetry. Brick Books. June 18, 2015. 10 Trailblazing Poetry Collections, CBC Books, National Poetry Month feature. Jittery, plaintive, and fresh, the poems in Ian Williams’ Personals are voiced through a startling variety of speakers who continually rev themselves up to the challenge of connecting with each other, often to no avail. “Book Learning: Polling Wordfest authors on books they were forced to read.” Swerve. Calgary Herald. Interview with Jacquie Moore. October 10, 2014. Q: A book you said you read but didn’t. A: Even if I read 24/7, there would still be a precious Lithuanian poet (published only five poems, but what brilliant poems) who finds her way into party conversation. It bothers me when people ask, “Have you read this? Have you read that?” as a means of ego-inflation. Writers Block. CJSW 90.9 FM Host: Emily Ursuliak. September 10, 2014. Volmers, Eric. “Griffin Nominee Wants Poetry to be Relevant.”Calgary Herald. September 9, 2014. It’s the sort of frankness that should make Williams an effective mentor when it comes to coaching other writers. “Ian Williams, Canadian Writer-in-Residence.” FFWD: Fast Forward Weekly. Interview with Drew Anderson. September 4, 2014. Tang, Stepahnie. “Introducing the U of C’s New Writer-in-Residence.”The Gauntlet. September 4, 2014. McCoy, Heath and Caitlyn Cummings. “Connecting with Ian Williams, New Writer-in-Residence.” UToday. August 18, 2014. Nineteen Questions. Interview with Jennifer Spruit. February 3, 2014. Me: Trying to be original is like trying to be cool. “The Three R’s: Ian Williams.” Slightly Bookist. November 15, 2013. Q: You can either write or read for the rest of your life, but not both. Which do you choose? A: You’re asking me to choose between blindness and silence. Where’s the ethics board? “The Poet’s Dinner Party: Dessert.” National Post. November 6, 2013. Interview with Michael Lista and Damian Rogers. Interviewer: Zoe Whittall. Q from Zoe Whittall: If you could invite any poet or poets to a dinner party, who would you choose and why? Ian Williams: I’d try to persuade Emily Dickinson to join me one winter evening for a slice of cake in a dim coffee shop. We’d sit near the back at a tiny round table and keep watch over the other’s scarf as it slips from the back of the chair. That’s as much as I could hope for. Maybe she will laugh. 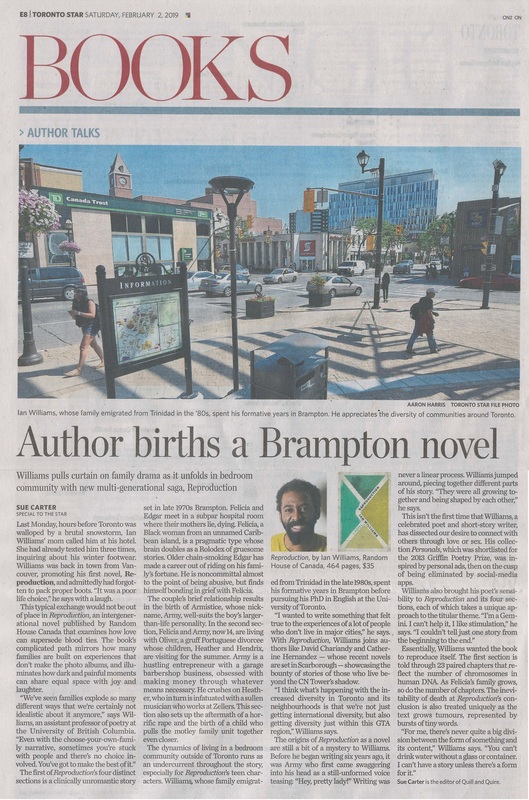 “Ian Williams: Poet Seeking Reader,” National Post, June 7, 2013. “I just knew this guy’s going to be one of the next big things in Canadian literature,” says Read. The premise is that I respond to eight questions posed by the Canadian literati. Q from Cathy Marie Buchanan: How do you know when your book is finished? A: Around draft 6, the microwave beeps. By that time, I’m eating more than cooking, reading more than looking. Q: What’s one book you’d give to a young writer? A: Margaret Atwood’s Power Politics. It begins my bookcase: top shelf, left side, like a cursor. Q: What is the one-sentence synopsis of your book? Reading this collection stokes a longing for more Canadian literature with narratives set in large Canadian cities featuring young Canadians dealing with contemporary problems. Williams’ work feels astoundingly fresh and important because of its subjects’ connections to the here and now. Examining how people his age (33) are affected by the pressures and politics of modern life intrigues him. DS Where do you write? IW I write on my hand; meta that, in my pocket on a tiny steno; meta that, on a laptop that has the battery lifespan of a goldfish and overheats; meta that, in morning sun and silence; meta that, between Ontario and Massachusetts.